The online parts diagrams do not show a damper rod. What is a “shuttle valve” design? Am working on the forks for the GT550 cafe project. The forks actually have damper rods, or at least they look like damper rods with 8 small holes. 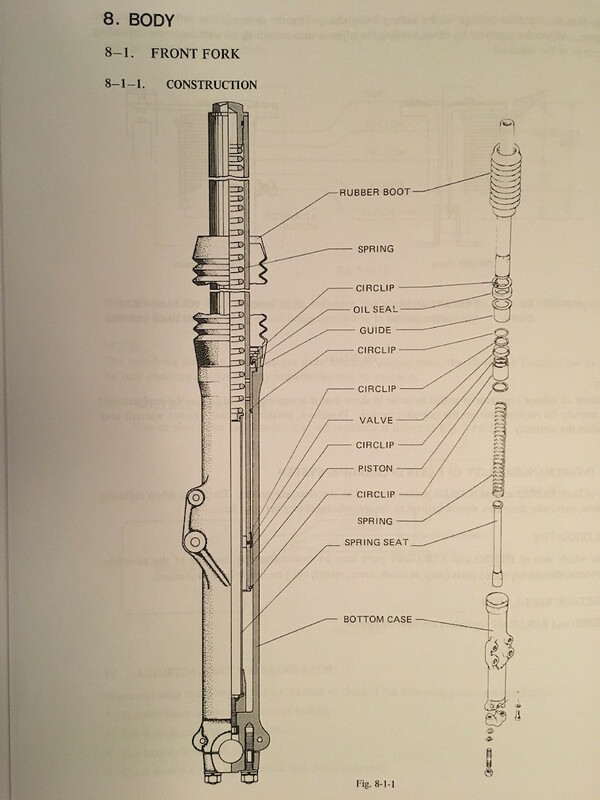 The service manual has a drawing of the forks. The “damper rod” is labeled as a “spring seat”. And the inner tube has a “Valve”. Shuttle valve was a term used by Triumph when they changed to that design of damping. It means that the piston and/or valve at the bottom of the legs is free to move up or down to alter the available orifice area. When the forks move, the valve also moves a small amount and partially covers or uncovers a ring of holes through which the oil moves and that's where the damping comes from. In one direction the holes are more covered than the other direction and hence different damping in compression and rebound. 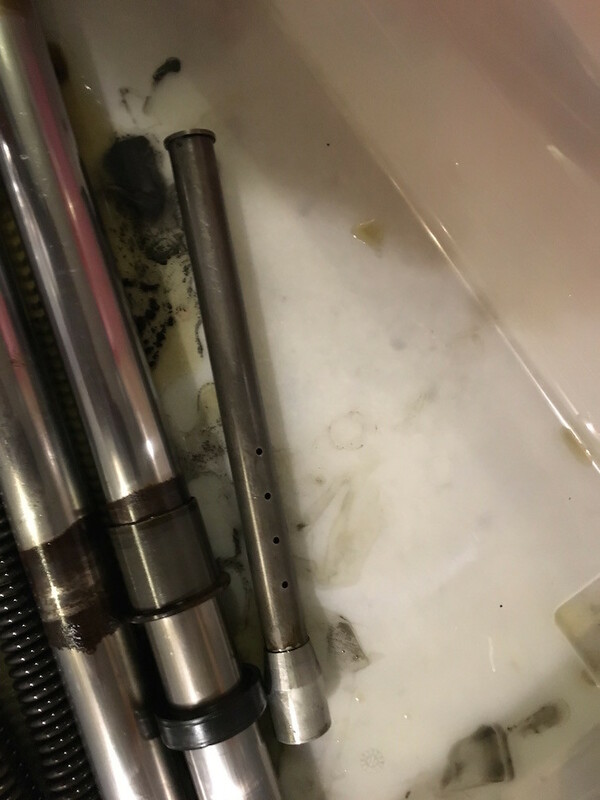 On Triumphs, I think the piston was also the valve and moved but on a GT550 IIRC the piston is fixed and only the valve moves. Not easy to change damping on those except by changing oil and they prefer thicker oil than modern forks because the orifices are much larger than on a modern fork design. Any thoughts on the fork oil viscosity that makes the best of this design? Not an answer for you but worth a read! That article provides useful fork spring info. Have been curious for some time about the mystery “HP-315” oil that the article recommends. Did some searches for vintage oil cans. Valvoline was big in racing oil back then & they labeled their oil cans with part numbers that were 3 digits. Unfortunately the Valvoline part numbers were unrelated to the type & viscosity of the oil. I typically end up with 30Wt fork oil in that design of forks. Found a topic where Alan H said he uses 20W/50. Also said that’s what Crooks Suzuki used when racing the GT550 back in ’72. And that was about all they had back in the day. Today we have expensive Fork oil and trans oil and whole section about that. The GT380 build got new oil seals & Bel-Ray 20 weight fork oil. Just used the existing springs & don’t know if they are stock or aftermarket. The results are pretty good but I don’t think I would recognize if it would have benefited by using 30 weight fork oil. Am trying to up my game on the GT550 & T500 builds. The T500 has GT500 forks. The GT550 & T500 will get aftermarket springs per the Cycle World article. The GT500 forks have super lame damping rods, so I’m looking into using damping rods for a GS-series bike + emulators. The emulator instructions include a recommendation for oil weight. That leaves the GT550 oil weight as a TBD. How would you describe the performance difference between 20 & 30 weight fork oil? Thicker oil does increase damping but whether it's enough of a difference is a whole different question. A change to Gold valves and decent damping would be a much more noticeable change on the road and if the GS forks have teflon bushes the difference will be easy to feel.